A special shirt we have made for the Managing Director of a large media firm. The fabric is from Acorn, in Lancashire, and is made of an excellent English cotton. The shirt is made even more unusual by the special collar trim and button sewing surround. Every part of this shirt was handmade, in London. Come and visit us (or we can visit you) to find out more about the different processes involved in making your handmade, bespoke shirt. See also: acorn, bespoke, Bespoke Shirts, bespoke suit, Bespoke Suits, bespoke suits london, Bespoke Tailor, bespoke tailors, custom tailored suits, Director, Henry Herbert Tailors, Lancashire, London, London Tailor, london tailors, managing director, savile row tailor, shirt, Shirts, Suits, suits london, tailor london, tailored shirts, tailored suit, Tailored Suits, tailored suits london, tailors in london, tailors london, wedding suits, wedding suits london, wedding tailor, wedding tailors. Wow – what a suit! Just what’s inside a Henry Herbert shirt box? Bespoke shirt with unique collar trim by Henry Herbert Tailors. 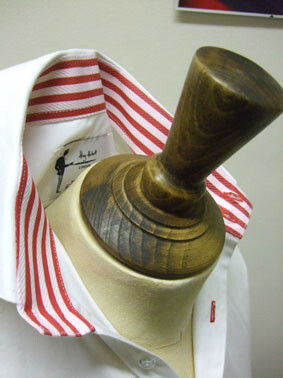 A striking bespoke shirt, with red stripped collar trim and button surround by Henry Herbert Tailors.